Rooted in the philosophy of Paulo Freire, ‘development education’ offers a critical point of resistance to the gross socio-economic inequality which fed the divisions of the UK’s EU referendum and US presidential election. 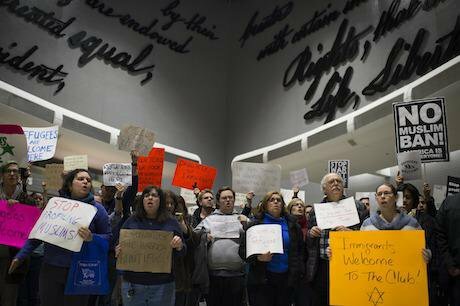 Anti-Trump protest, Philadelphia International Airport, January 2017. USA TODAY Network SIPA USA/PA Images. All rights reserved. The political systems on both sides of the Atlantic have been subjected to seismic quakes and perpetual uncertainty following Britain’s decision to leave the European Union in June 2016, and the election of Donald Trump as US president in November. Political commentators have been left scratching their heads over what Brexit plus Trump actually means for us all, and they have been bracketed in this debate because similar factors seem to have played a part in their outcomes. These include the mutually professed political affinity between Donald Trump and the UK Independence Party’s Nigel Farage; both are popular nationalists who made political capital from platforms that sought a reclamation of a perceived lost sovereignty and promotion of protectionism to restore lost economic lustre. Trump and Farage positioned themselves as outsiders shaking up the failed political establishment and appealed to communities that felt abandoned by the political elite. The economist Thomas Piketty found evidence of this decline in the United States with new research showing “that over the last 30 years the growth in the incomes of the bottom 50% has been zero, whereas incomes of the top 1% have grown 300%”. And in the UK, the Joseph Rowntree Foundation found in 2014-15 that 13.5 million people or 21% of the total population were living in low-income households; a proportion that has barely changed since 2002-03. Meanwhile, at the other end of the economic scale we are witnessing the accumulation of grotesque amounts of wealth by the 1%; billionaires taking advantage of high yield investments and low tax havens. A report published this January by Oxfam found that “eight men own the same wealth as the 3.6 billion people who make up the poorest half of humanity”. The report suggested that the “very design of our economies and the principles of our economics have taken us to this extreme, unsustainable and unjust point”. It asserts that neoliberalism “wrongly assumes that wealth created at the top will “trickle down” to everyone else”. Static incomes and high unemployment in communities cut adrift by the global economy only partly explain the political traction of Farage and Trump. We can add to this toxic mix the spectre of racism, particularly but not exclusively directed at Muslims. Amid increasingly rancid posturing toward Islam, Trump has vacillated from banning all Muslims from entering the US to a temporary ban on seven Muslim majority countries. He also pledged that all undocumented immigrants living in the US – of which there are 11.3 million – “have to go”. Mexican immigrants have also been decried by Trump in appallingly racist terms. Mexico, he said, “are (sic) sending people that have lots of problems, and they are bringing those problems to us. They are bringing drugs, and bringing crime, and their rapists”. Across the Atlantic, the enduring image from the EU referendum debate in the UK was a poster unveiled by UKIP just days before the vote that screamed “Breaking Point: the EU has failed us all”. It showed thousands of refugees in Slovenia in 2015 who had just crossed the border with Croatia, and the obvious message to voters was that membership of the EU was exposing Britain to similar levels of immigration. The poster’s strapline told voters: “We must break free of the EU and take back control of our borders”. The image and associated messaging suggested that the UK was struggling to cope with a sharp spike in refugees that was placing public services at “breaking point”. The facts point to a different reality. The UN’s Refugee Agency estimate that nearly nine in ten of the world’s refugees are sheltered by developing countries, not the EU. In the first two weeks of November 2016 alone, more than 44,000 refugees from South Sudan arrived in Uganda, which is greater than the total that arrived in Britain in all of 2016. The Refugee Council found that the UK had the sixth highest number of asylum applications in the EU in 2016, and was ranked sixteenth in terms of asylum applications per ‘head of resident population’. Between January and September 2016, Germany had received 781,000 asylum applications which towered over the UK total of 41,000 which represented just 3% of the EU total. In a global context, the United Nations High Commission for Refugees reported that there were 65.3 million forcibly displaced people in 2015 with a majority of 68% hosted by countries in Africa and the Middle-East; just 6% were hosted in Europe. Britain, for example, has hosted just 4,414 Syrian refugees since the conflict began from a total of 4.8 million, and promised to resettle 20,000 Syrian refugees by 2020 which is a paltry 4,000 a year. This is not to underplay genuine public concerns about migration or to ignore the spike in the number of migrants, particularly from countries in conflict such as Afghanistan and Syria, trying to make their way to Europe. Public services can be strained by new arrivals and communities may feel ill-equipped or even threatened by the location of migrants in their locality. But the reality of inward migration in Britain is often exaggerated both by the media and politicians. For example, by the end of September 2016, the Refugee Council reported that Britain received just 29,246 asylum applications suggesting that comparatively few migrants are seeking safety in the UK. But UKIP, like Trump in the US, has managed to configure migration in uniformly negative terms and peddled myths that resonated with many who voted to leave the EU. Migration has been used as a straw man by Trump and Farage to account for, at least in part, stagnating wages, the decline in public services and lack of decent jobs. This in turn has resulted in rising levels of hate crime and racism with ‘nearly 900 hate incidents’ reported within the 10 days following Trump's election on 8 November. The myths about refugees, migration, the economy and Islam suggest that the Trump presidency will be characterised by a battle for truth and, in this battle, development education should play a critical role. Rooted in the revolutionary conception of education by the philosopher, practitioner and activist Paulo Freire, development education believes that active citizenship can result in social transformation and the eradication of inequality. As Irish Aid suggests, development education “empowers people to analyse, reflect on and challenge at a local and global level the root causes of global hunger, injustice, inequality and climate change; presenting multiple perspectives on global justice issues”. Development education provides critical thinking skills of enquiry and demystification that reveal truth, support analysis and enable action. Education has a critical role to play in the battle for ideas around how we manage the world’s natural resources, how we treat migrants, how we manage our economy and how we integrate with other cultures and societies. Development education is not a neutral process. It consciously sides with the marginalised and dispossessed and argues for more just and equal social relations. We need development education to become more firmly integrated into formal and informal education systems if we are to combat grossly distorted economic inequalities and the kind of poisonous social attitudes that manifested themselves during the EU referendum and presidential election. Before despairing of an inexorable drift toward the right in the UK and US that could further undermine already weakened government services and social protections, we should build on the popular markers of resistance already in train. They include: the mass mobilisation of women that trumped the crowd attending the new president’s inauguration; the throngs of volunteer attorneys and activists that flocked to American airports to offer assistance to refugees and citizens from the seven Muslim-majority countries banned by Trump from entering the US; and in the UK, the 1.6 million people who signed a petition who oppose an official state visit by Donald Trump to Britain. With executive orders that have included a temporary ban on refugees and construction of a wall along the US-Mexico border, Trump has simultaneously become a polarising president and galvaniser of resistance on a wider scale than ever could have been envisaged under Hillary Clinton, his Democratic challenger for the presidency. It is Trump’s extremism that potentially encompasses his downfall, particularly his debasing of many of the key values – compassion, social justice, respect – that many Americans hold dear. Some commentators have found echoes of Brexit and Trump in the period of economic recession, racism and xenophobia in the 1930s that paved the way to fascism and war. This is probably a warning not to take too literally but does suggest how extreme neoliberal economics can dangerously distort social relations and attitudes in periods of steep decline. In this context, development education can become a critical point of resistance to the gross social and economic inequality that fed into the divisions manifested in the UK’s EU referendum and US presidential election. It can also serve as a push factor, encouraging the kind of activism essential to creating a more just and sustainable world. openDemocracy is partnering with the World Forum for Democracy, exploring the relationship between education and democracy. Read more here.